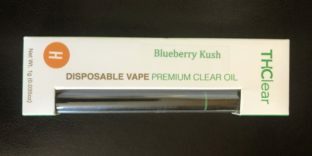 Get a little kushy with this THClear Co. Blueberry Kush Disposable pen, you won’t regret it. The sweet, berry terpene profile of Blueberry is perfectly encapsulated in an easy-to-transport cartridge. This disposable pen contains 1 gram of pure, premium-quality cannabis distillate.